There are those of us who have never grown anything in our lives! Then there are those of us who are experienced gardeners with large plots of land and a greenhouse. Oh…and let’s not forget everyone in between! No matter your level of gardening know-how, growing your own winter lettuce and/or microgreens can be a gratifying, empowering, and pleasurable pursuit during the cold months of winter. Not to mention the added benefit of being able to provide superb nutrition for your family through homegrown, fresh winter greens. Although it is very tempting and not to mention convenient, to simply go to the store and buy a plastic bag of spinach, mixed greens, or arugula; by growing your own you are saving yourself and your family from ingesting countless toxins. Did you know: Bagged greens are washed and treated in a water solution containing 50 to 200 ppm of chlorine. Interestingly enough, swimming pools only require an average chlorine level of 2 ppm and many sources warn of using levels higher than 10ppm. Growing your own is sounding better and better! At least you know exactly what is in and on you food. However, any ole package of mesclun seeds or microgreen seeds will do. In the past I’ve even scattered my seeds for sprouting on a seed tray a top potting soil; and they’ve grown into lovely microgreens. Don’t stress about getting the perfect seed from a specific seed company. Just find something locally and don’t be afraid to ask the employee at your favorite nursery for help. They are gardeners at heart, and they love to give advice! Plant seed in an organic rich potting soil or compost. The major issue you have growing indoors is moisture level. Potting soil is good because it is designed to regulate moisture. I’m just to cheap to buy it and I’ve always had good luck growing in my own compost. Tip: Use a spray bottle or mister to keep top layer of soil moist until seedlings emerge. The sky’s the limit…get creative! 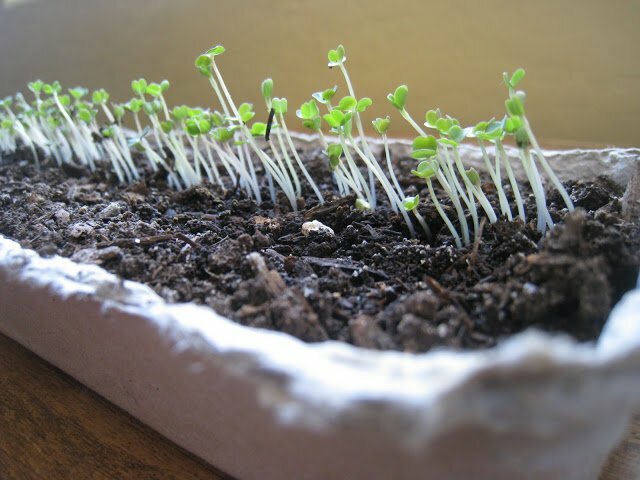 Within 3-5 days you will begin to see the seedlings emerging. 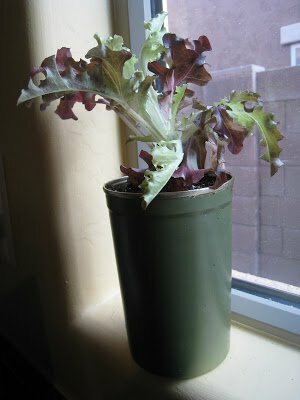 As the plants begin to grow and get bigger, begin harvesting the outer leaves whenever you need them for use in meals. The plant will continue to grow from the inside out, giving you a continuous harvest all winter long. -If you can’t find what you’re looking for locally or choose to order seed online, I recommend to buying from Seed Savers Exchange, The Sprout People, Johnny’s Seed, Baker Creek Heirloom Seeds, or Gardener’s Supply Company. They’re all great companies and I’ve ordered from each without difficulty. -Interested in learning how to grow during the brutal winter? I highly recommend Eliot Coleman’s book The Winter Harvest Handbook: Year Round Vegetable Production Using Deep Organic Techniques and Unheated Greenhouses. Great tips and information especially for those living in zones 4 and 5! Share with us your winter growing methods! What are your favorite veggies to grow this time of year? 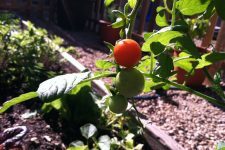 Excellent & informative…people just don't realize how much they can garden with the dreary winter weather! i've got the exact same baker creek seed arugula packet hanging on my fridge, reminding me I need to stop by the Seed Bank and get more! I am big on seasonal cooking, but I never considered growing this stuff indoors during the winter. I've been missing my summer spinach and lettuce…I'm so trying this immediately. Thanks so much! Great idea! We planted a raised bed garden this past Spring for the first time and I am hooked! I was desperate to grow something now that the garden has been cleared, so I am sprouting broccoli and chia seeds! I think I'll try some greens now! Thanks! I had no idea how chlorinated "washed" greens are! That's terrible! Thanks for all the excellent information, as usual. I learn SO much from your site! Great to know! I had been wondering if there were good indoor vegetables to grow during the winter. What a great idea. That chlorination process is not publisized. I heard they do it to baby carrots too and that's why they turn whiteish after opening. Great post. Thanks for the inspiration. I picked up "Making Supper Safe" at the library last week (which is a good read BTW), and I've been newly inspired to clean up our diet which is pretty good. I have a window in the dining room that would be perfect for growing greens since it gets lots of light and has a radiator underneath. I just would need to keep an eye on the hydration as you mentioned. I also like that you include books to read which I'm adding to my library list! It's scary what they are putting in our foods today. Going green and growing your own food is the only way to go to ensure your health! Do you have much difficulty growing these cool-weather loving crops in your heated home? @Sam(antha) Great question! We keep our home pretty cool in the winter:) Usually set in the sixties and they grow great. Some days when the sun is out, I place them outside for some fresh air. I guess I am so spoiled here in California (Zone 9) to be growing the things you mentioned outdoors from September to April. After that though, it is too hot to grow lettuces and such, and we have to get them from 3 hours away from the cool coastal farms. 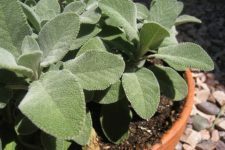 But now that I'm thinking about it, I may try some herbs indoors, just so they are closer to where I can nip them off and not have to go outside. Thanks for the idea! Have you had any problems with fungus gnats? I have tried several times to bring a potted chive inside and each time, those pesky little gnats invade! Not sure if this will help with knats but it has helped with those weird ‘mushrooms/toadstools’ that come up in my potted plants: sprinkle the soil with cinnamon. I love planting all sorts of herbs and greens during the winter months and then replant them outside during the warmer months. They really cheer me up during the dreary wintertime and they taste delicious as well! Really? I didn’t know this! I’m so excited and I can’t wait to try this. Thank you! I never realized we could grow spinach indoors…we have grow lights in the basement where we keep our plants (cactus, succulents, flowers etc.) so would it be ok to put them down there or do they need to be in the sun?? I enjoy your website and Facebook Page so much. Thank you. 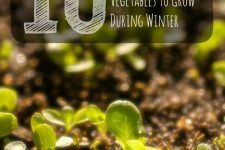 Great info–adding this to our blog’s list of resources on fall and winter gardening! 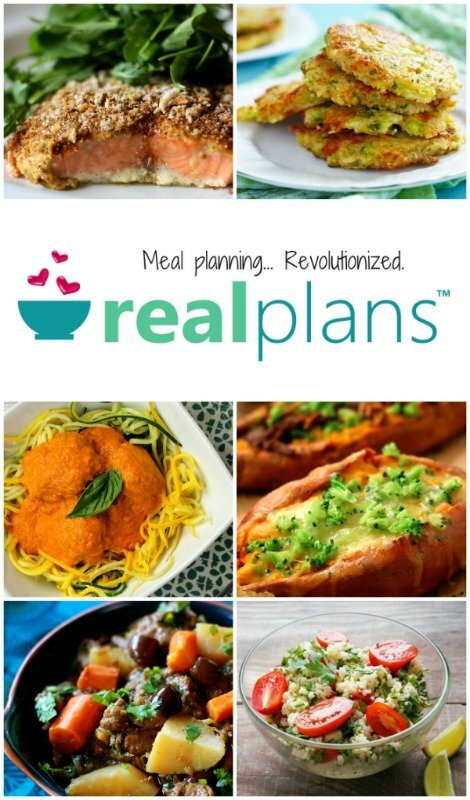 What about spinach during Spring/Summer? Im gonna try growing in a cold frame (upstate New York) What would you recomend for that and what would do better inside. you have to wash fresh produce in a Clorox bath . A couple of tsps to a sink of water to wash off the aluminum from the soil. On lettuce and greens chlorine keeps them from spoiling to fast. It DOES matter where you get your seeds. Google the disaster that is Seminis/Monsanto. Stick with companies that have signed the Safe Seed Pledge. The clorax thing is gross. Why don’t they just use vinegar? Wouldn’t that do the same thing? I was just discussing the idea of growing our own spinach to my husband last night. I’ve never grown anything before, but I’d really like to give it a shot. The older I get, the more concerned i am with everything that’s in our food these days. One question tho, I live in Alaska and the winter months can get pretty dark. Leaving a plant in the windowsill won’t help it much. Is there anything else I could do to give them the “sunlight” they need? I have some shop lights that we replaced the regular bulbs with grow bulbs. I grow lettuce and spinach all year round. I currently have tomato ,peppermint and carrots growing indoors as the temps outside are awfully hot. spinach and lettuce do well in mild temps and tend to bolt when temps go over 70*. I bought the grow bulbs for the shop lights at walmart. they also have regular grow bulbs for light sockets and fixtures. Love This!! Anything that has to do with sustainability, recycling, and good health is brilliant….and this has all three 🙂 Pinned it and I’m a true fan now. Here in upstate NY I grow greens, herbs and certain tomatoes all thru the winter. This year for the first time I am planting winter gardens to be covered with fabric and then plastic with the hopes to be harvested throughout the winter. I am building cold frames to house lettuces and to have ready to start stuff early in the spring. 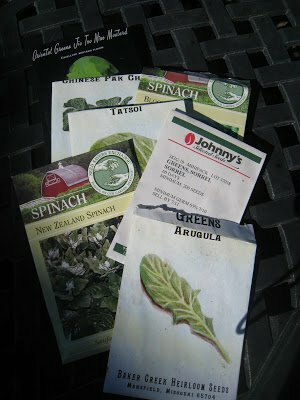 I grow beds of greens in plastic under-bed containers that I drill drainage holes in and fill with grow mix and compost. I cut greens for salad and soup all winter long. My barely heated basement with NO natural light stays between 55 and 65 degrees. I have standard shop lights with two white and two grow lights in them. I hang them from chains and keep just over the plant, raising as they grow. Harvest with scissors and enjoy. No special care needed except water, feed with fish emulsion every other week. Do you find that indirect light is adequate for growing greens or do they need a sunny window or grow light to flourish? How about the temperature. That is also needy to let a plant grow in the winter? What is the constant temperature ?